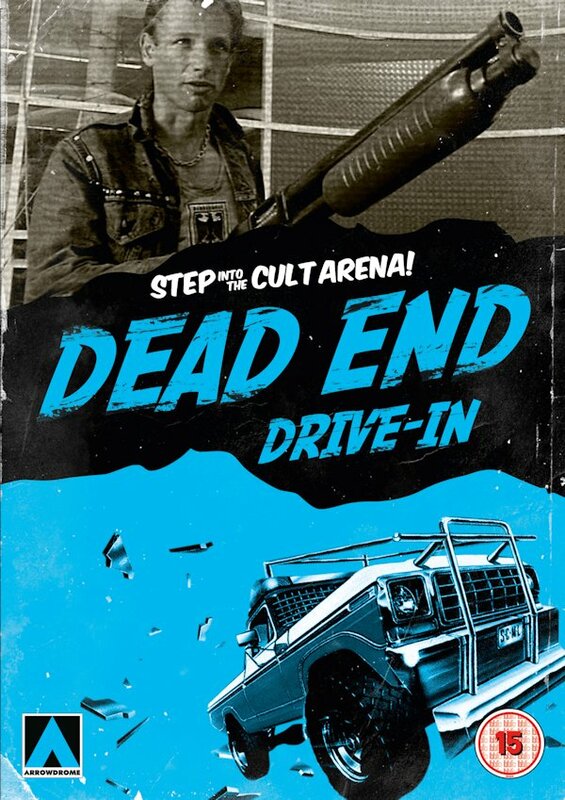 Realm of Horror - News and Blog: Dead End Drive in UK DVD review. Dead End Drive in UK DVD review. Arrow video are releasing the cult 1986 movie "Dead End Drive In" to DVD this month, and they were kind enough to send me a screener copy to take a look at ahead of it's release. Set in Australia in the not too distant future, society appears to be in a semi-dysotopian state, following the wake of a series of ecological disasters, financial meltdowns and civil uprisings. Unemployment is high, crime is rife and gangs of punks known as "Cowboys" cruise around in beat up cars looking to scavenge parts from traffic accidents. Young 'Crabs' (played by "Prisoner : Cell Block H" star Ned Manning) is one of the few people lucky enough to have a job, but when he takes his girlfriend Carmen (Nathalie McCurry) to a Drive-In theatre, he tells the desk clerk they're unemployed so he can get in cheaper. Something he will later come to regret. Whilst him and his girlfriend are indulging in a bit of hanky panky in the back seat, somebody swipes the wheels off his car, meaning they're stuck there the night. It's only the following morning when the other cars have left, he realises somethings not right. Seems there's quite a few other cars that have been immobilised and it looks like many of them have been there a while. Yes, it turns out that the place is actually an elaborate trap, designed to ensnare the unemployed and undesirable types to keep them off the street, and now they're effectively prisoners. Stuck inside the theatre with gangs of various punks and low-lifes, Crabsie is of course not too happy about this and wants out. But being stuck in the middle of nowhere and with no serviceable transport, thats going to be no easy task. Particularly when the other people stuck there seem to rather like getting free movies and free junk food. But he's not going to let that stop him, so when the government start bussing in more homeless people, he seizes his chance, steals a tow truck and one of the most outrageous police chases and shoot-outs ever seen, quickly ensues. The film is rather ridiculous, but thoroughly enjoyable at the same time. Interesting to note that the film was shot at an actual disused Drive-In theatre in Matraville, Sydney, which had been derilict for some time. So needed very little set dressing to give it the run down look seen on film, and was actually pulled down shortly after filming had finished. Directed by cult filmaker Brian Trenchard-Smith, it seems to have been heavily influenced by the first Mad Max movie, except this seems to be more of a campy comedy than a straight action film. But then that is to be expected from the director who gave us "Turkey Shoot" and "Leprechaun 3 & 4" (the former title can even be seen rather cheekily playing on the Drive-In screen in one scene). I believe I'm correct in saying this is the first time the film has been available on disc in the UK. Extras are limited to a theatrical trailer, which is a pity as I would really love to have heard a directors commentary on this, or at least an interview or something. But aside from that, if you enjoyed Brian Trenchard-Smith's other films, or you enjoyed other 'Ozploitation' classics like "The Cars that Ate Paris" then you'll undoubtedly want to pick this up and you really can't go wrong with the Arrow disc here. The film is available on UK DVD from Monday 8th April. BYZANTIUM - New UK Poster artwork. Knightriders - A UK BD/DVD review. Evil Dead remake No1 in the US!!! Hudson Horror Show 7 (US) - Line Up Announced!